A unique data storage tool like no other, the Gemini Pen USB Drive combines a Hi-Speed USB with a ballpoint pen! Made out of sleek and powerful lacquer over brass, this beautiful promotional USB pen keeps the USB safe beneath a polished end cap. The Gemini comes with a Free 4-Color Silkscreen, so you can customize your drive with your logo or personal brand printed on it. The Gemini custom drive and other customized pen drives are available with FREE shipping. They say the pen is mightier than the sword, which begs the question: What is our Gemini custom USB mightier than? Most other USBs on the market, that’s what! This combination Hi-Speed USB flash drive and pen is a versatile, powerful tool. With data storage capacities ranging from 128MB to 32GB, this customizable drive is perfect for storing documents, pictures, multimedia, videos, music, presentations, and other important files. The custom Gemini is also a fully functioning ball point pen! Made of sturdy lacquer over brass, it’s a handsome and sleek flash drive. 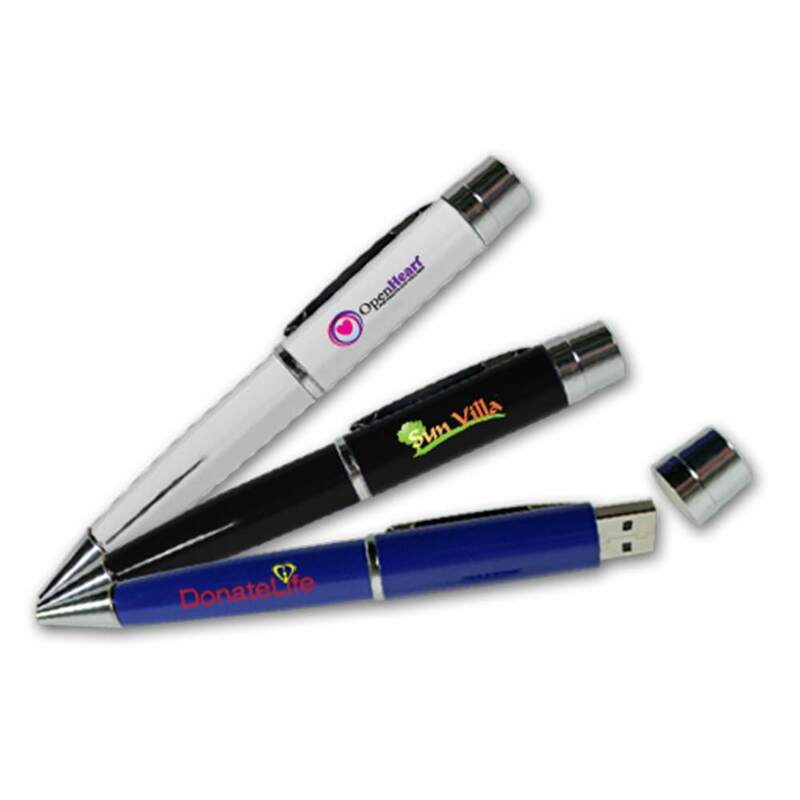 The Gemini Pen comes with a Free 4-Color Silkscreen, so you can personalize it with your logo. The USB connector is concealed beneath the polished endcap for safekeeping. The Gemini comes with a sturdy clip that allows you to easily store this pen in a shirt pocket, briefcase, or purse. The Gemini is available in black, silver, or blue. It comes with a shock resistance of 1,000G, up to 10 years of data retention, and a limited lifetime warranty. 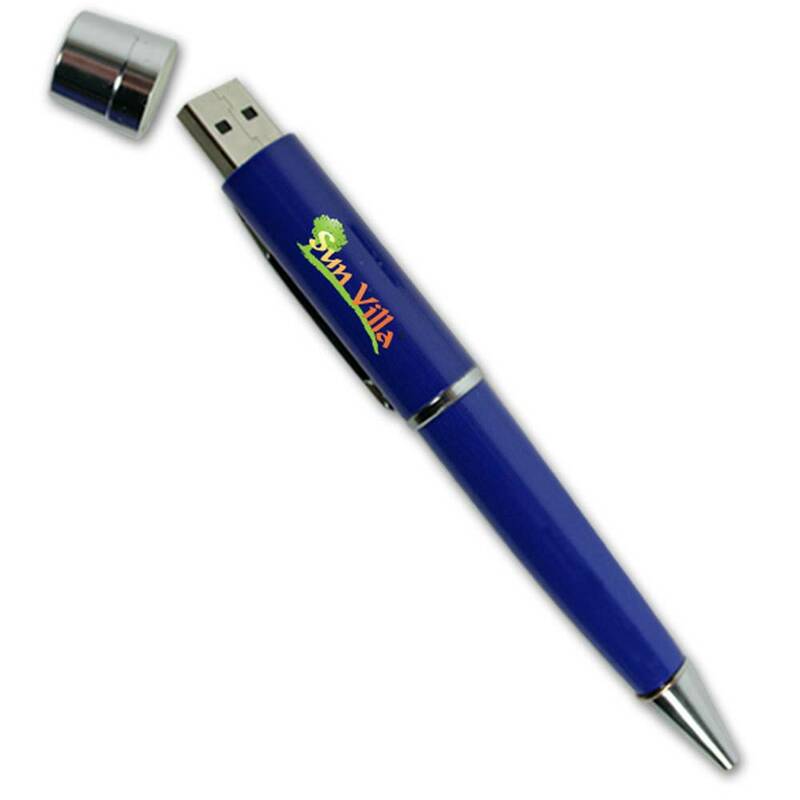 The Gemini Pen USB is available with FREE shipping. Turn time for customizing your pen drive is about ten business days, which means your customers be writing and storing with your Gemini in no time!